This article is about the men's football club. For the women's football club, see JK Tallinna Kalev (women). For the basketball team, see BC Tallinna Kalev. JK Tallinna Kalev, also known as Tallinna Kalev, or simply as Kalev, is a football club based in Tallinn, Estonia, that competes in the Meistriliiga, the top flight of Estonian football. The club's home ground is the Kalev Keskstaadion. 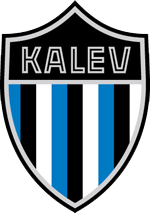 Formed as Meteor in 1909, the club changed its name to Kalev in 1911 after joining the Estonian Sports Association Kalev. The club were founding members of the Estonian Football Championship in 1921. Kalev have won three league championship titles, in 1923, 1930 and 1955. The club was re-established in 2002 and has played in the Meistriliiga since 2018. Kalev's origins lie with Meteor. Jalgpalliselts Meteor (Football Association Meteor) was formed in 1909 by students Julius Reinans and Bernhard Abrams. The team was first coached by an English flax merchant John Urchard who also ordered the team's first uniforms, consisting of blue shirts and white shorts. The team included several players who would become notable athletes, such as future Estonia national team players Voldemar Luik and Otto Silber and Olympic runner Johannes Villemson. On 6 June 1909, Meteor and Merkuur played the first official football match in Estonia. The match took place at the grounds behind the Lower Lighthouse in Lasnamäe and was won by Meteor 4–2. On 27 May 1911, Meteor joined the Estonian Sports Association Kalev and changed its name to Kalev. In 1913, the team moved to the new Tiigiveski Ground. In the 1920s, the newly formed Estonian Football Championship was dominated by Tallinn sides Kalev, Sport and TJK. The derby matches between the clubs drew thousands of spectators. Kalev won their first league title in 1923. The team included Estonian internationals such as Eduard Ellmann, Ernst Joll, Elmar Kaljot, August Lass and Arnold Pihlak, who went on to represent Estonia at the 1924 Summer Olympics. On 16 August 1925, the team suffered a serious setback when the board of the association expelled eight key players from the squad over their decision to play in the opening match of TJK's new ground without the board's permission. The players subsequently joined TJK. Tallinna Kalev won their second championship in the controversial 1930 season. Although never proven officially, the victory was widely accepted as a result of match fixing. To win the title, Kalev needed to win the final game of the season against the formidable Narva Võitleja by eight goals. Kalev went on to win the match 11–0. Võitleja's performance was so poor that allegations of match fixing began instantly, with Kalev board member Aleksander Mändvere being accused of bribing Võitleja players, particularly the team's goalkeeper Viruvere. Kalev reached the 1939 Estonian Cup final, but lost to TJK 1–4. Following World War II and the Soviet occupation of Estonia, Kalev joined the Soviet Union football league system, competing in the second tier of Soviet football from 1947 to 1954, while Kalev's second team played in the Estonian championship. In 1955, Kalev's first team returned to the Estonian championship, winning their third league title in the 1955 season. In 1960, Kalev joined Class A, the top flight of Soviet football. The team finished their first season in Class A in 19th place out of 22 teams. In the 1961 season, Kalev finished last and were relegated to Class B.
Tallinna Kalev was re-established on 1 September 2002 and joined the Estonian football league system. The club won the Northern division of the III liiga in 2003. In 2004, Aavo Sarap was appointed as manager and Tallinna Kalev won the East/North division of the II liiga. The club finished the 2006 Esiliiga in third place and were promoted to the Meistriliiga, returning the top flight of Estonian football. Tallinna Kalev finished the 2007 season in sixth place. In August 2009, Sarap's contract was terminated and he was replaced by his assistant, Daniel Meijel. The team finished the 2009 season in last place and were relegated. In January 2010, Sergei Ratnikov was appointed as manager. Tallinna Kalev won the 2011 Esiliiga were promoted back to the Meistriliiga. The club finished the 2012 season in ninth place, but avoided being relegated by defeating Tarvas 3–1 on aggregate in the relegation play-offs. In December 2012, Frank Bernhardt was appointed as manager. Tallinna Kalev finished the 2013 season in eighth place. In January 2014, former Estonia national team manager Tarmo Rüütli took over as manager. Rüütli subsequently left in March 2014 and was replaced by Sergei Zamogilnõi. Following a disappointing 2014 season, where Tallinna Kalev finished in 10th place and were relegated to the Esiliiga once again, Marko Pärnpuu took over as manager. Tallinna Kalev returned to the Meistriliiga after finishing the 2017 season as runners-up. In November 2017, Pärnupuu was replaced by Argo Arbeiter. The club's home ground is the 11,500-seat Kalev Keskstaadion. Opened on 12 July 1955, the multi-purpose stadium was built near Kalev's old Tiigiveski Ground. Initially named Kalev Komsomol Stadium, the name was changed to Kalev Keskstaadion in 1989. It used to be the largest football stadium in Estonia until the completion of A. Le Coq Arena in 2001. The stadium is located at Staadioni 3, in Juhkentali, Kesklinn, Tallinn. Tallinna Kalev use the artificial turf, located next to the Kalev Keskstaadion, for training and home matches during winter and early spring months. ^ a b c d "History". Tallinna Kalev. ^ a b "Kalevi Keskstaadion" (in Estonian). Estonian Football Association. ^ Malkin, Mikhail (22 June 2009). "Estonia toasting 100 years of football". UEFA.com. ^ a b "Top 10 - meistriliiga šokeerivaimad juhtumid 1921-1940" (in Estonian). Soccernet.ee. 3 February 2016. ^ "JK Tallinna Kalev". Estonian Football Association. Retrieved 11 September 2018. Wikimedia Commons has media related to JK Tallinna Kalev.